This gorgeous Canadian landscape postcard was issued by prolific Ottawa-based publisher the Photogelatine Engraving Co., Limited. The Ontario company opened its doors in 1910, closing them for good in 1953 after a prolific period producing classic view-cards of Canada. Whilst this particular card is in pristine, uncirculated condition and therefore difficult to date precisely, the style is very much like other vintage cards the company produced during the 1930s – white, or rather, unprinted borders left around absolutely stunning tinted collotypes. 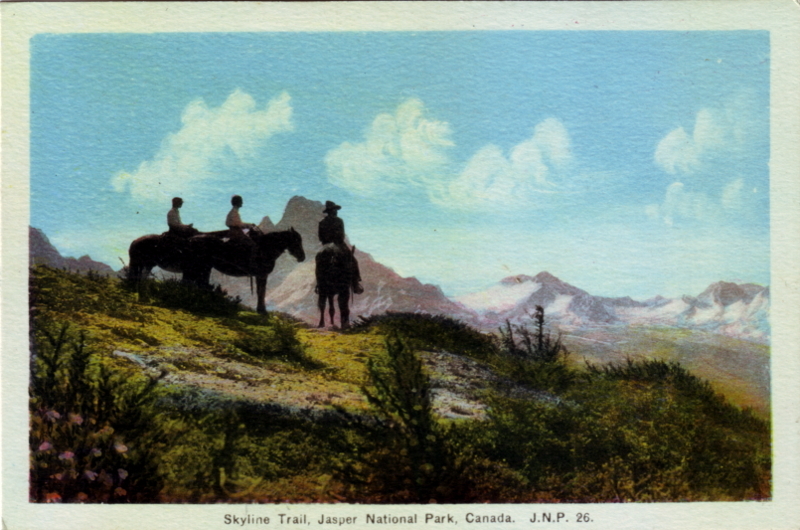 The Skyline Trail, in what is now a UNESCO World Heritage Site, the Jasper National Park in Alberta, is a favourite spot even to this day amongst hikers and is famous for its magnificent views of peaks such as Mount Assiniboine in the Canadian Rockies. Whilst the riders on horseback looking out over the view may conjure up ideas of cowboys – particularly to European eyes – this image of man gazing in awe at nature is wonderfully evocative and utterly timeless. Check out the Vintage Postcard Store for more Canadian postcards! To get a feel of the Skyline Trail today watch the video below or click here to watch it on YouTube! Thanks for sharing the great postcard and information. Looks like a beautiful place.